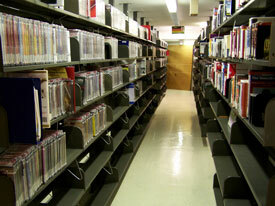 Falvey Memorial Library :: DVDs, CDs and Audio Books? DVDs, CDs and Audio Books? Have you noticed the empty shelves where the DVDs, CDs and audio books used to be shelved? Don’t worry; they were relocated to Falvey West in preparation for the next phase of the library renovation project. Domenick Liberato, stacks manager for Access Services, and his team, Phil Mairs and Barbara Haas, BalaBharat Guduru (graduate shelving assistant), Morgan Smith and Marissa Losoya (undergraduate student assistants) quickly moved the DVDs, CDs and audio books to their new locations. These items’ records in the library catalog have been changed to show the new site. Liberato said, “As shelving supervisor I wish to extend my commendations and appreciation to the … group of hard-working folks in recognition of the great job they did in transferring the DVD collection, the audio book collection and the music CD collection…” He noted that the work began on a November Monday morning and was completed by the afternoon of the following day. The current periodicals browsing collection will be moved to Falvey West in the near future. Contributed by Alice Bampton and Gerald Dierkes.